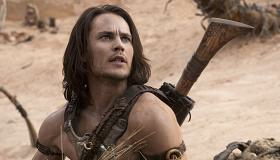 It's Taylor Kitsch's season. Just passing 30, this heartthrob has made his biggest splash playing Tim Riggins in TV's Friday Night Lights and now steals the show from CG aliens, BBC mini-stars and this generation's answer to Xena Warrior Princess. A surprisingly convincing Civil War cavalryman, Kitsch's John Carter loses everything to become an unwelcome prospector and then get magicked onto "Barsoom," (a.k.a. Mars). There, John Carter of Earth meets the Princess of Mars and baddy Mark Strong (resembling a reject from Dark City) to lead many nations and two species into battle for a vaguely identified "freedom." All this while Ciaran Hinds shows too much belly and Willem Dafoe voices a four-armed green alpha Martian. It's got the schmaltz and grandeur of the 80s Clash of the Titans but little of the warm wonder that made that spectacle such an addiction. The seasoned cast are remarkable with their stentorian proclamations of gobbledygook (in King's English, of course) but the spectacle is just a massive event that passes you by—for all its gloss and expenditure, it's missing heart, which is a surprise because it was directed by Andrew Stanton, the man who transformed a near-featureless CG robot named Wall-E into the heart wrenching Chaplin surrogate of tomorrow's distended dystopia. Based on the 1912 serial by Edgar Rice Burroughs that spawned like twenty reprisals, Carter's graphic novel pedigree will earn those pre-fab fans with easy appeal, but may not leave them happy. Predictably brusque and solitary, John Carter is a down-on-his-luck prospector: we don't know he's a highly desirable cavalryman until a blonde Bryan Cranston seeks him out and orders his henchmen to wrestle Carter to the ground. Thereafter, multiple fast cuts move him from an outpost, to an office to a holding cell as quickly and nonsensically as the cut that drops him from an Arizona cave to the sand dunes of Mars. After shaking off the confusion, he learns there are some major advantages to being an earthling on this new planet: particularly, brutish strength and a superhuman capacity to jump great distances. He was valuable on earth, but on Mars he's a mini-god! He's found on the day a community of 12-foot, four armed monsties (led by Willem Dafoe) retrieve their hatchlings from a sand nest. John is spared from death and thrown in with the green slimeballs for cultural indoctrination—he emerges all abs and tunic, magically able to understand the natives, though some words (crucial ones, like Barsoom) remain beyond the reach of translation. It's a world where technology and faith are equally revered and indivisible and where a master race of morphing watchmen manipulate the fates to match the agenda of "The goddess" we'll never meet. Mark Strong, in a metacomment on his career, plays the head of a trio of morphing men—they become people much in the same way Agent Smith does in The Matrix, but the result is less menacing and more comical, since the morphers interim costume is a frosty, high necked robe (while the rest of Mars dons beach wear), and Mark Strong didn't need help perfecting that cue ball look. The film's biggest (and saddest) crime is malaise—it's not that John Carter doesn't care about what it's doing, it just can't make us care, even though the magnitude of every event, conflict and emotion is as melodramatic as its Victorian roots. Since John Carter first appeared in 1912, one presumes that whatever oddities this story invented may well have been original at the time, but after so many remixes and reinventions of serial content, this "original" just looks like a desperate mash up of curios mined more usefully and intriguingly elsewhere. Tragic, really. While I'm all for excavating bedrock in a field as overexploited as serials/comics, this one didn't reach origin, it just reviewed rubble. And that rubble was showy but even it's made of used parts.